I can’t believe that it is November already… fall is really flying by! I can’t wait for the upcoming holiday season, last year was so hectic that I feel like I didn’t get to enjoy it as much as I should have so I’m looking forward to being a little more prepared for it this year. Every Thanksgiving either my parents or my grandmother host a big dinner for the whole family and then I make a separate dinner the following weekend for my husband and I, which we have dubbed “Thanksgiving 2.0”. I took tons of pictures from all of the meals last year and I can’t wait to start sharing them with you so that maybe you’ll be inspired to make some of them for your family this year! I’ve added a Thanksgiving tab to the menu at the top of the homepage and that’s where you can find a compilation of all the recipes, crafts, etc for that holiday. I’m also going to start including a printable version of the recipes at the end of each post (just click on the picture to pull up a regular sized picture and then print right in your browser in any size you like). I thought I’d start my Thanksgiving themed posts with a simple recipe, a side dish, that would be fantastic to make in the meantime if you want to practice! 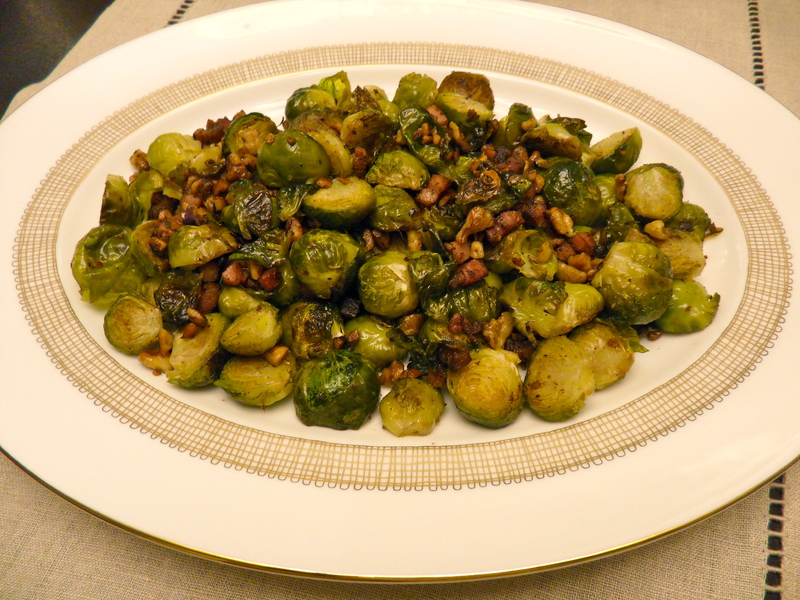 Brussel’s sprouts get sautéed in bacon fat and and then roasted in the oven and topped with toasted walnut pieces giving you the perfect combination of flavors. The bonus of this side dish is that it just gets thrown in with the turkey for the last bit of cooking time so you don’t have to worry about juggling oven space and temperatures! The turkey I made last year got cooked at 350 degrees so if you’re just making this as a side dish without a turkey, start off by preheating your oven. Wash and peel about 2 pounds of brussel’s sprouts, cut off the root and halve each one. Preheat a cast iron skillet over medium heat. Take a two ounce slab of bacon and cut it into lardons (rectangles 1/4″ across and 1″ long) and add it to the skillet with 1/4 cup chopped walnuts. Cook until the walnuts are toasted and the bacon is crispy, about 4 minutes, then transfer to paper towel lined plate using a slotted spoon. 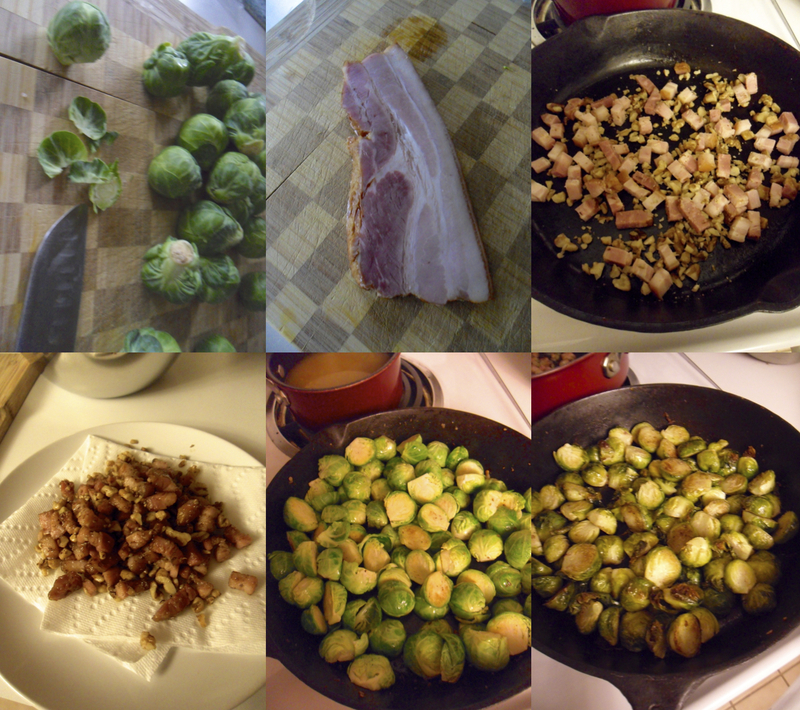 Add the brussel’s sprouts to the bacon fat in the skillet, season with salt and pepper and toss to coat. Roast in the oven for 30 minutes then add in the bacon and walnuts and roast for 15 minutes more. Click on the picture below to bring up a printable version of the recipe and print right inside your browser. If you like this recipe, make sure you check out my brussel’s sprouts with maple-balsamic drizzle from this post! Never liked Brussel Sprouts until I tried them made similar to your recipe last year. Now I really like them! Thanks for the recipe. I think they have a bad reputation, as I never tried them until a couple of years ago… they’re really versatile and yummy!